Native Range: Northeastern United States, the Great Lakes region, New Brunswick, and Nova Scotia with isolated populations in northern New York and Quebec (Cardoza et al., 1993; Conant and Collins, 1998). Not historically found in Virginia south of Rockingham County, in most of northwestern New York, or in the Cape Cod region (Buhlmann and Mitchell, 1989; Ernst et al., 1994; Conant and Collins, 1998). Table 1. States with nonindigenous occurrences, the earliest and latest observations in each state, and the tally and names of HUCs with observations†. Names and dates are hyperlinked to their relevant specimen records. The list of references for all nonindigenous occurrences of Glyptemys insculpta are found here. 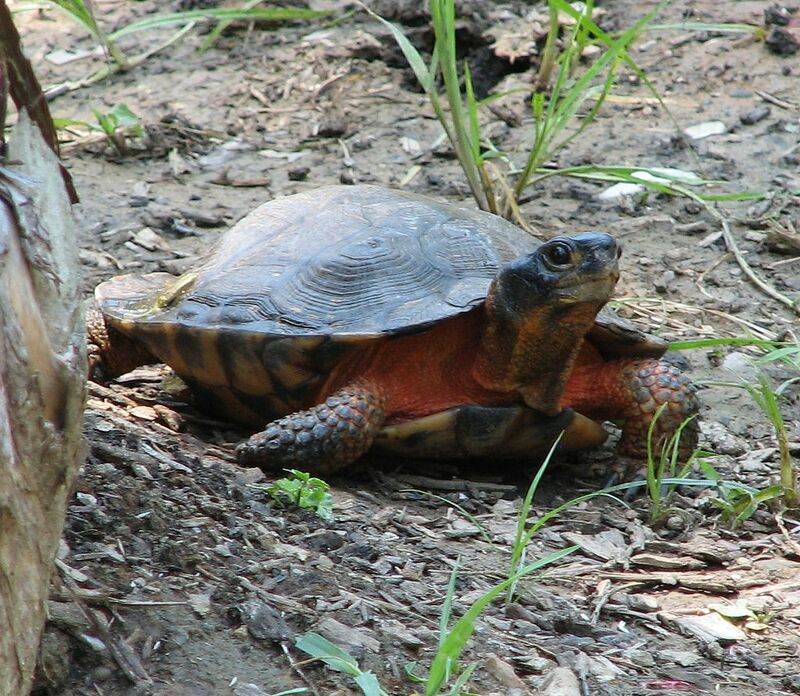 Ecology: The wood turtle inhabits wetlands, streams, and rivers, as well as meadows, forests, and farmlands adjacent to water (Ernst et al. 1994; Conant and Collins, 1998). The species hibernates in water, and is most aquatic in the northern portion of its range (Ernst et al. 1994; Conant and Collins, 1998). Mating peaks in spring and fall and nesting occurs in May and June, when 4 to 18 eggs are laid in holes excavated in the soil (Ernst et al. 1994). Means of Introduction: Pet release. Status: Failed in Florida and Massachusetts. Cardoza, J. E., G. S. Jones, T.W. French, and D. B. Halliwell. 1993. Exotic and translocated vertebrates of Massachusetts, 2nd edition. Fauna of Massachusetts Series 6. Massachusetts Division of Fisheries and Wildlife, Publication 17223-110-200-11/93-C.R, Westborough, MA. Conant, R. and J. T. Collins. 1998. A field guide to reptiles and amphibians. Eastern and Central North America. Third Edition, Expanded. Houghton and Mifflin Co. Boston. Ernst, C. H., J. E. Lovich, and R. W. Barbour. 1994. Turtles of the United States and Canada. Smithsonian Institution Press, Washington and London. Lazell, J. D., Jr. 1976. This broken archipelago: Cape Cod and the islands; Amphibians and Reptiles. The New York Times Book Co., New York. Author: McKercher, E., and Fuller, P.